Wildlife Control Powell: How Can I Keep Raccoons Away from My House? How Can I Keep Raccoons Away from My House? Raccoons are cute when you see them at a distance, but when these bandit-faced critters invade your yard, or worse — your home — they become a real nuisance. Whether they tear up your garden, tips over your trash cans, or make a nest in your attic, raccoons pose a threat to you, your family, and your pets’ health and safety. Raccoons are curious, unpredictable, and they carry rabies, parasites, and nasty bacteria in the fur that they pick up when rummaging in the trash. Safeguarding your home is your best bet for steering clear of these curious critters. Today, the pest control experts at Critter Wranglers will share a few tips with you for keeping raccoons away from your home. 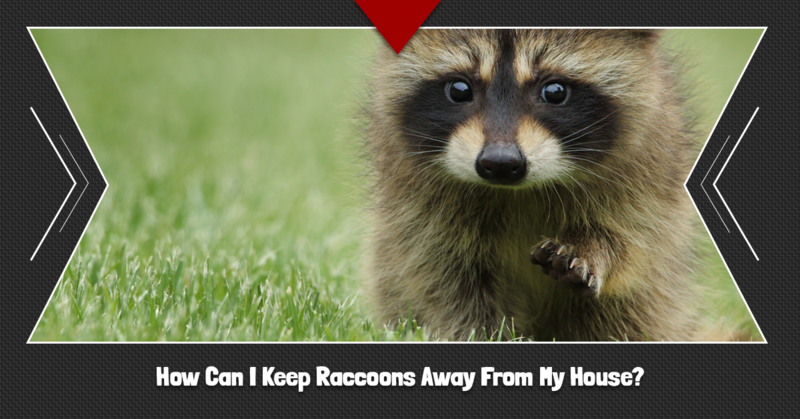 Should you have a raccoon problem, call us for Top Rated Local® wildlife control in Powell. Raccoons will seek shelter, especially in areas close to food and water sources. Raccoons often find people’s attics, crawl spaces, and garages to be the perfect cozy place to set up a home. The best defense for keeping raccoons out of your home is to seal off potential entryways and exits. Inspect the exterior of your home for openings where raccoons could get into your home. Look near windows, vents, and in the soffit of your roof and repair these areas to close up any holes, gaps, or openings. Raccoons are attracted to any food source, including fruits and vegetables commonly found in gardens. Once they find a food source, chances are, they’ll return to sneak another bite. Simply installing a small fence or another type of barrier around your garden area can help keep raccoons and other wildlife out of your garden and away from your home. Raccoons are nocturnal animals, which is why installing bright lights and decorative light fixtures in your yard can help deter them from your property. Outdoor sensor lights that are triggered by movement will blast a bright light in your yard, which may help keep these critters away. You might also install solar garden lights that you can place in gardens, along walkways, and other areas to keep raccoons away. Be sure to keep a light on at night where you place your trash cans to help prevent them from rummaging through your garbage. Along with keeping your trash can areas well-lit, it is crucial to secure your trash bins. Doing so can prevent raccoons from removing lids to get to the trash inside the can. Additionally, securing the trash can lids can help ensure the trash stays in the bins, even if the critters knock your trash cans over. Bungee cords work really well for securing trash can lids in place. Raccoons are drawn to pet food left outdoors. Make sure to feed your pets indoors and if you keep your pets outside, it’s important to clean up any spilled pet food and remove your pet’s food bowls to eliminate a potential food source for raccoons. Keep in mind that raccoons need water, too, and may drink from your pet’s water bowl. This could potentially spread bacteria and disease to your pet, and places your pet in danger if they try to defend their food and water bowls from a hungry, thirsty, and feisty raccoon. Along with pet food and water bowls, something as simple as bird seed could be enticing for hungry raccoons. They might even find a bird bath as an easy way to get a drink of water. If you hang bird feeders, it’s best to put them away at night and rehang them in the morning. Empty birdbaths, pools, and other containers that could become a water source for raccoons. If you suspect you have a raccoon problem, call Critter Wranglers right away. We’ll come to your home, inspect your property and your house for signs of raccoons, and if we identify a raccoon problem, we will remove them immediately. Our raccoon removal services are safe, effective, and humane. Plus, we can animal proof entry and exit points to prevent them from returning. We’re just a call or click away, so reach out to Critter Wranglers today to schedule an inspection and get an estimate for raccoon removal. Find our why Critter Wranglers is Powell and Knoxville’s favorite wildlife removal team.